New York’s medical marijuana industry officially launches today, less than six months after the state awarded MMJ business licenses. Eight of the 20 dispensaries allowed in the state will begin serving patients, while the remainder will open on a rolling basis over the rest of the month, according to the New York Health Department. Despite the symbolic significance of a large state like New York rolling out a medical marijuana program, the market opportunity is tempered by a relatively narrow list of qualifying conditions and bureaucratic hurdles to getting patient cards. A prohibition on smokable cannabis could also limit the size of the market, as dispensaries are only able to sell capsules as well as oils and tinctures that can be vaporized or used in inhalers. The 2015 Marijuana Business Factbook forecast sales of between $40 million and $65 million in the first full 12 months after dispensary openings, but the tally could come in much lower or higher depending on how the first few months play out. Ari Hoffnung – the CEO of Vireo Health New York, one of the five companies that won licenses to grow and sell medical marijuana in the state – acknowledged that business might be slow at first. He should know: Vireo Health’s parent company operates a grow facility and dispensaries in Minnesota, which also bans smokable cannabis. That market has gotten off to an extremely sluggish start (though there are other factors as well, as Minnesota’s program is more limited than New York’s). But Hoffnung is confident the industry will eventually take off in New York. “I think what we learned from our experience in Minnesota is that the program is likely to start out small, in terms of patient count, and will expand over time as awareness increases both on the physician side and on the patient side of the program,” Hoffnung said. He added that New York is a big state with almost 20 million people, a significant number of whom have cancer, epilepsy, HIV/AIDS and other qualifying conditions. “Over time the patient population will grow,” Hoffnung said. New York has not made public how many patients have registered so far. Fewer than 150 physicians have registered to be eligible to prescribe medical marijuana, but Hoffnung said he is confident their numbers will also grow. In the meantime, he urged marijuana businesses in New York to reach out to physicians and the public to raise awareness about the program. “The most important thing going forward will be public education,” Hoffnung said. Education and publicity will also be the priority for Etain, another licensed MMJ company. New York launched its MMJ program relatively quickly, as it often takes states two years or more to launch dispensaries after medical cannabis is legalized. The state’s governor signed the medical marijuana legalization bill into law just 18 months ago. While some states have launched just as fast – or even faster – very few have been able to get their industries up and running just a few months after awarding licenses. New York’s law requires licensed companies to open their first dispensaries this month – a timeline that seemed in jeopardy at one point. The state’s governor “gave us an extremely ambitious timeline to get the medical marijuana program up and running, and I am pleased that we have met his goals,” Dr. Howard Zucker, New York’s health commissioner, said in a statement. Getting to this point hasn’t been easy. While Hoffnung called the day “historic,” he also said the marijuana business and regulatory landscape need improvements, most notably in regards to banking solutions for marijuana businesses. “New Yorkers don’t like putting up with nonsense. And I think some will be frustrated to a degree when they come into dispensaries and are told that their MasterCard or Visa won’t work,” Hoffnung said. 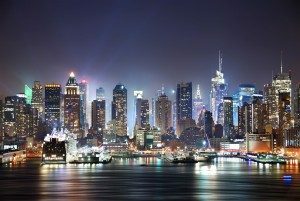 Last summer, New York awarded five companies licenses that allow them to open one cultivation site and up to four dispensaries. Businesses will have to reapply every two years to keep their permits. License fees are $200,000, but will be reassessed. Three of the license winners – Bloomfield Industries, Etain and Vireo Health of New York – opened two dispensaries today, all of them in upstate New York. The other two license winners are starting with just one dispensary. Columbia Care will open a dispensary in Manhattan’s famed Union Square, while PharmaCann will open its dispensary in White Plains, a suburb just north of the Bronx. Once all of the dispensaries are open, New York City will have four – two in Manhattan and one each in Queens and the Bronx – while four will be in its suburbs. The other 12 dispensaries will be scattered across upstate New York. Overly-restrictive regulations and a prohibition on smokables is most likely the reason for “low patient turnout.” If the state wants to rake in megabucks in taxes, they need to legalize across-the-board. The biggest problem is finding a qualified doctor. My doc’s office told me that there are NONE in Central New York that they could even refer me to as I live in the Syracuse area. What kind of sick joke is New York state trying to pull on it’s residents who do qualify for medical marijuanna? More of our high taxes at work. It only takes four hours online to become a qualified doctor, wtf? On the first day of one dispensary’s medical cannabis sales in Albany, the New York state capital, not even 1 patient showed up to make a purchase. Etain chief lady Hillary Peckham, speaking to reporters inside the “nondescript” facility, stated that prices for her company’s vaporizers, pills and oral sprays would range between $300 and $1,200 per month. If only Gov. Andrew Cuomo would stop taking it upon himself to dictate what the medical cannabis market in New York looks like, and who qualifies. It’s really none of his business. New York Governor Cuomo and The department of health panel screwed New York businesses and handed out at least three of these to either out-of-state or an inexperienced applicants. For instance, the management team for Etain, the Peckham family have never held jobs before. By their own admission they have no work experience outside the home. Is it a surprise that they made a first time political contribution to Governor Cuomo prior to the award? Is it a surprise that they won a license when their lobbyist also represents the union who has the franchise for this business in New York? Way to go New York State handing over a license to trust fund babies! Please quit throwing stones at the Peckham ladies, Achnad Achnad. First, your comment that they “have never held jobs before” is totally false, considering Amy Peckham’s role in her husband’s construction materials supply company. While you are correct to perceive the Peckhams as “inexperienced applicants” (what legal growers ARE “experienced” here in staunchly anti-cannabis New York? ), many other New Yorkers see Hillary and Keeley, in particular, as truly compassionate sisters who’ve been handed a golden opportunity (Keeley also has experience in horticulture). In honor of their late grandmother, who passed recently from one of the qualifying conditions in NY, I think Hillary and Keeley are performing an essential public service by creating a new business and jobs to serve qualified medical cannabis patients. They are affiliated with awesome national groups like Women Grow, which strives to empower women in the burgeoning cannabis industry. Please just be happy for the Peckhams and deal with it. They need our support, not ritual condemnation.